Here's a very good starter eyepiece that won't break the bank! With a 1.25" barrel and 12 mm focal length, this compact and lightweight eyepiece gives bright, crisp, and wide-angle views of the Moon, planets, and deep-sky sights with any telescope. High-index glass with broadband multi-coatings enable a wide 60 degree apparent field of view with excellent color correction and minimal image distortion. Blackened lens edges and anti-reflection threads ensure maximum image contrast. Viewing position can be adjusted with fold-down rubber eyecups. Made from black anodized aluminum, and the base of the barrel is threaded for standard 1.25" filters. To minimize the need for refocusing, this eyepiece is parfocal with other eyepieces in the same series. 4.3 (Based on 3 Reviews) 67% of reviewers recommended this product. Got two of these for my WO bino's. Sharp all the way to the field stop. Great views and can't beat the price. 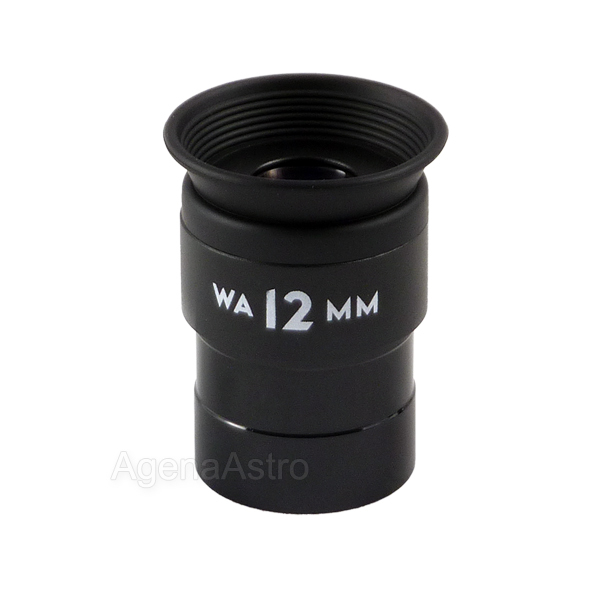 The WA 12 available from Agena Astroproducts is a 4 element 12 mm 60 deg field of view (fov). It is about the same size and shape as a similar focal length plossl but has a somewhat larger eye lens and eyerelief to go with the the greater fov. I measured the eye lens to be 15mm wide and the stated eye relief is 10mm (I have read this varies with the focal ratio of the telescope). This eyepiece offers plenty of eye relief for a person without glasses like myself but could restrict the fov for someone with glasses. So how does this WA 12 perform? I have used it in two different dobs, but mostly in a 10 inch F/5. In that scope the view is sharp to within 20 pct. of the edge and then gets soft. Not bad but you have to in-focus a mm or so. There are some sea gulls in the outer 10 percent as well on bright stars. In this respect it is not as good as better plossls but far better than my W-70 series 19mm or even my 30 mm superview in this telescope. Also, the problem all but clears up when barlowed. In fact, at 200X in my F5, it shows good planetary detail such as the great red spot on Jupiter. Also, without a barlow, the moon fits nicely into the sharp portion of the fov much larger but with as much edge as my Meade series 3000 plossl. 4.0 The WA 12 eyepiece should be a good buy for many. Provides a clear sharp 60 degree fov when barlowed or in a slow scope. At F/5 it is soft in the outer 20 pct of the fov. The WA 12 available from Agena Astroproducts, Burgess and others is a 4 element 12 mm 60 deg field of view (fov.) eyepiece for 47 dollars (current list price at Agena). It is about the same size and shape as a similar focal length plossl but has a somewhat larger eye lens and eyerelief to go with the the greater fov. I measured the eye lens to be 15mm wide and the stated eye relief is 10mm (I have read this varies with the focal ratio of the telescope). This eyepiece offers plenty of eye relief for a person without glasses like myself but could restrict the fov. for someone with glasses.